As I shared at the beginning of this year, my angel for 2013 is the Angel of Enthusiasm. Early this morning she led me to a book on Ascended Masters Teachings, called The Bridge to Freedom Journal. 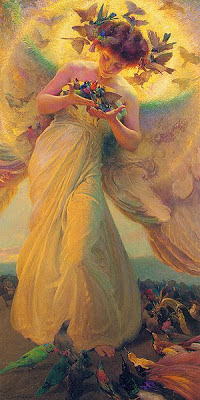 I came across an inspiring passage on the angels written in 1958, that was going to be called "The Year of the Angels." "What TREMENDOUS JOY TO SERVE GOD, beloved ones, especially when you have the great buoyancy of the angelic host to sustain your enthusiasm in that service, when you have the angels' faith to sustain your TRUST IN GOD, when you have the healing power of the angelic host instantly available at your call..."
The Angels play a very great part in the activities of accelerating the vibratory action of the strata of consciousness in which humanity lives. Angels are real friends and always answer your call. They are so easy to work with. They are beings of transcendent, divine Love! They are extremely intelligent, but their love responds instantly to the direction of anyone who calls earnestly to them in the name and authority of their own I AM Presence. The Angels remind us that without enthusiasm nothing can be accomplished. So get excited about the divine plan that is unfolding and reach out to the Angelic host for protection, guidance, and love. The more often you make the calls, the more powerful you'll feel their loving radiation.